“We go down a narrow alley to the rear of some shops and into an even narrower alley, half of which has been carefully made into a chicken house with a new locking door – security is an issue here. We meet Mary as she chases out the last of the chickens from the house to the tray of chicken feed : she is giving her chickens medicine today to protect them from disease. The new hens, three months old now, are growing bigger and she is hoping that they will start to lay eggs soon. As we watch the chickens settle to the food she tells us that she is thinking of selling two of her young cockerels in order to buy an older one. 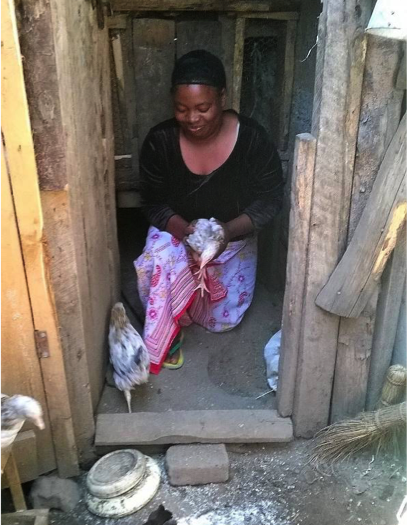 Keeping chickens for both meat and eggs should give Mary extra money to provide for her family. If you would like to help support more women like Mary, we are currently raising funds for our next round of grants and loans. To help us achieve our target you can donate here.